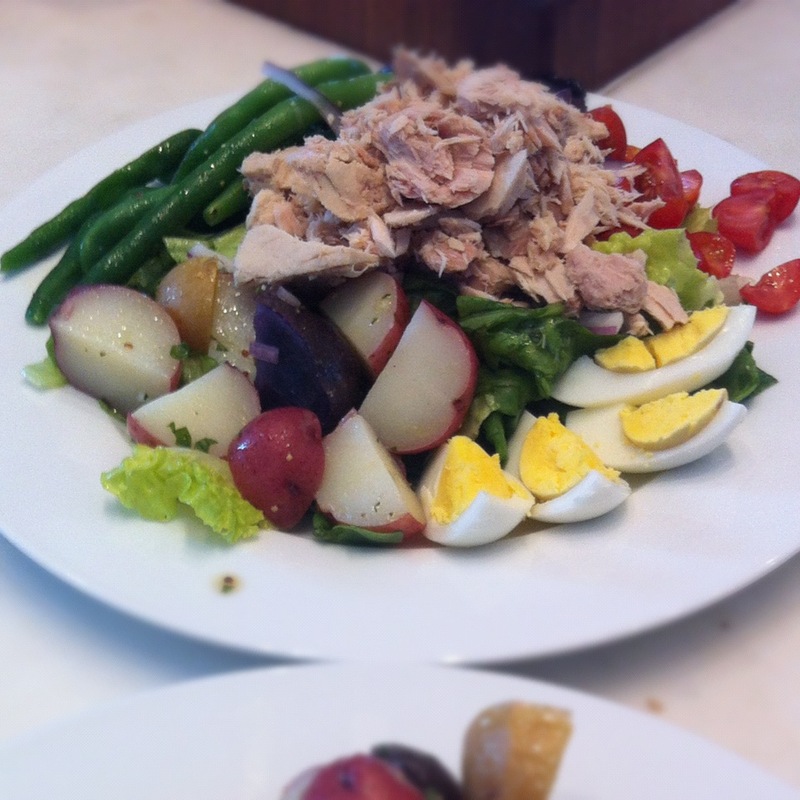 Salad Nicoise is one of my all time favorite dishes. This classic French salad is perfection on a plate. The Nicoise (pronounced ni’swaz) salad is named for the South Eastern region in France where the nicoise olive is grown, near Nice located in the Cote d’Azur. 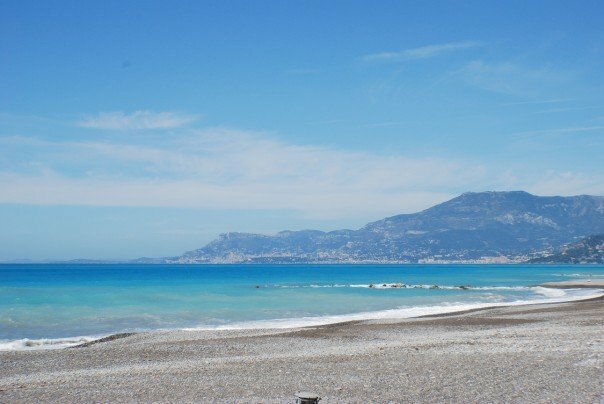 The Cote d’Azur is so gorgeous, crystal blue Mediterranean water, palm trees and sea side restaurants selling more fresh fish, wine and Salad Nicoise’s than you can imagine! Its a light and refreshing lunch and perfect in the summer when its hot an humid and you’d prefer not to feel like a beached whale after stuffing your face with a huge sandwich. Even sitting in snowy Utah, making this salad with its fresh ingredients, always brings me back to this beach- its a little vacation on a plate. Hope you enjoy! 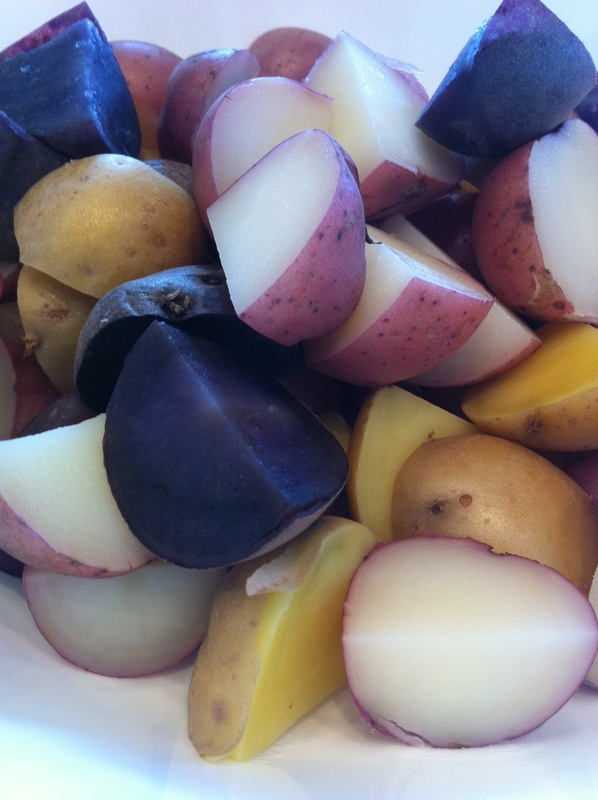 Bring potatoes and 4 quarts of water to boil (do not boil the water first and then put potatoes in- bring to a boil with potatoes in the water already- this prevents your potatoes from being too mealy). Cook until potatoes are tender about 8-10minutes. Remove potatoes from water with slotted spoon. Keep the boiling water. Toss potatoes with 1/4 of the vinaigrette and set aside. While the potatoes are cooking toss lettuce with 1/4 of vinaigrette and arrange on to plates. Mound tuna in the center of the lettuce and group tomatoes, olives and hard boiled egg and separately around the plate. Once potatoes are cooked and dresses, arrange reserved potatoes in a mound at edge of lettuce bed. Return water to boil; add 1 tablespoon salt and hericot vert. Cook until tender but crisp, 3 to 5 minutes. Drain beans and quickly transfer to an ice bath to stop them from cooking. Toss beans and onion with a small amount of dressing and arrange with the rest of the ingredients on the bed of lettuce. Drizzle another 1/4 vinaigrette over the top of the plated salad and season with salt and pepper. 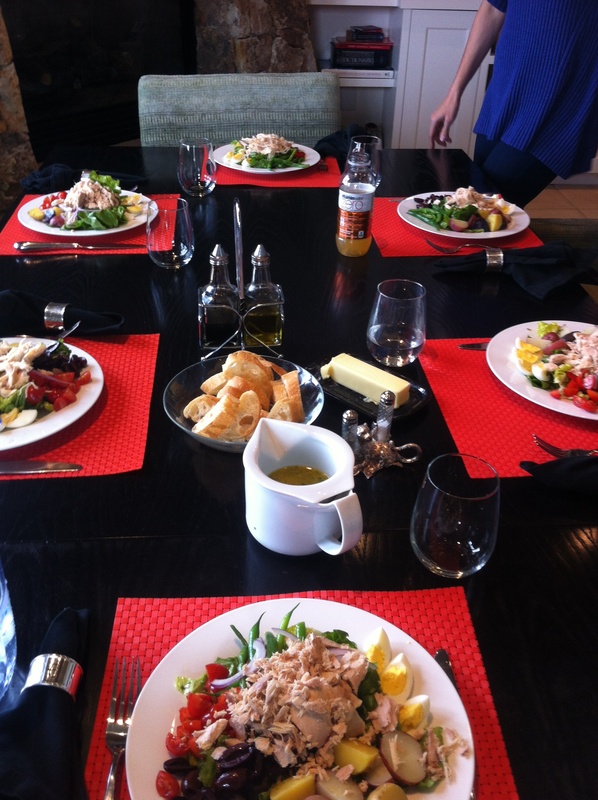 Place the remaining salad dressing on the table for guests to dress their salad to their liking. Serve immediately with French bread and preferably a glass of wine! This entry was posted in Entrees, Family Favorites, Recipes, Salads and tagged green beans, potatoes, Salad Nicoise, Tuna by skibootsinthekitchen. Bookmark the permalink.